Seems to me that every old-world country has an herbal tonic (or a dozen) that are purported to cure all that ails you. 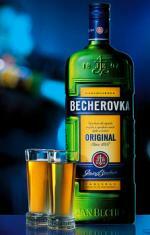 Becherovka is the Czech Republic’s cure-all. Invented in 1807 by Josef Becher and Christian Frobrig, Becherovka is a blend of herbs, spices, oils, alcohol and the mineral rich water of Karlovy Vary. The herbal liqueur is typically served cold as a digestif, but is also consumed as a home remedy for arthritis. I can’t speak for Becherovka’s curative properties, but I can speak for its tastiness. Which, I’d imagine, is more important to you anyway. First, a honey-like sweetness hits your palate, though it’s lighter than you’re led to expect by the smell. Clove is definitely the main flavor player, but cardamom, cinnamon and allspice also play key roles. The clove, while the dominant flavor, is not overpowering. Sipping this ice cold after a meal is a treat. Especially in the hot summer a nice cold digestif cools you and finishes out the meal in what feels like a very sophisticated manner. But, what of cocktails? I didn’t go crazy with this one, but I did try a couple experiments. First, I found that it blends tremendously well with a cup of hot tea. Don’t go overboard, add only an ounce to a cup of tea and the herbal and spice flavors really play well with the tea. Following that, I decided to try one of Becherovka’s signature drinks, the Beton. A Beton is Becherovka and tonic. It seems simple, and it is, but the flavors are far more complex than the recipe. The citric and bitter notes of the tonic work really well with the sweetness and spice of the liqueur. I like to keep the ratio fairly low at 3:1 tonic to Becherovka. By not overdilluting you allow the liqueur to stay front and center. The drink is complex, but refreshing. I’d definitely drink this again. When I first opened the package of Agwa de Bolivia and started reading the materials I felt like I should be keeping an eye out for the DEA. Agwa is made from coca leaves (yeah, like the ones that make cocaine) that are picked in Bolivia and transported, under armed guard, to Amsterdam. 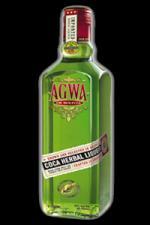 Once there, the leaves have their cocaine removed and the leaves are then distilled into Agwa liqueur. So, what does 40 grams of coca leaves per bottle taste like? Kinda herbal, not surprisingly. I’d describe the flavor as a mix of green tea and mint. The flavor is light and quite refreshing. The color is bright lime green and the aroma is vegetal and herbal. The flavor is this liqueur is definitely unique. Wanting to make a cocktail with it I decided to give it a try in a mojito. The herbal and mint flavors of the Agwa combine very well with the muddled fresh mint resulting in a refreshing and complex cocktail. In addition to the flavor, the green color of this drink is striking. An interesting twist on a classic that I’d try again if for no other reason than the story. If you’re interested in something simpler you can drink this as a shot. Bite a slice of lime then drink the Agwa. I’m not a big shot person but this combo was pretty good. So, there you have it. If you’d like to change up your coca intake or start a new habit, Agwa has you covered. I’ve never been sailing, never been to Bermuda and, at least to my knowledge, am not the slightest bit royal. What I am is deeply enamored with this cocktail. As I’ve said before I can always tell when I really like a cocktail because I keep wanting to make it for myself. The wanting part of that sentence being the key. I’ll try recipe after recipe for cocktails I don’t much like, just in case there might be a diamond in the rough. This one, like a few of my other favorites before it, I mix willingly and with a great sense of eagerness. I didn’t stray far from the proverbial cocktail nest with this drink. The recipe I found in Vintage Spirits and Forgotten Cocktails but it originally dates back to the Bartenders Guide by Trader Vic. Whom, you’ll likely note, is the very same who’s known for a host of delightful Tiki drinks. Dr. Cocktail notes that this is an “early example of Trader Vic’s burgeoning tropics-oriented (but yet to be Tiki) repertoire.” I would agree whole-heartedly. This drink includes falernum, a classic Tiki syrup, but keeps it simple and elegant. There are a couple other recipes that I found, but they really only vary slightly. For example, the Difford’s recipe ups the rum to 2 1/2 oz but leaves everything else the same. 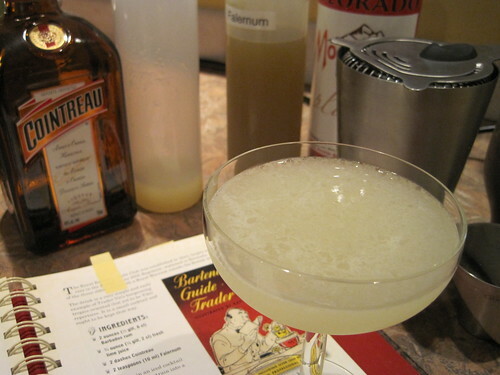 To see how a Barbados rum would change the cocktail I used the only one I have on hand. Namely, Mount Gay Extra Old. This rum is fantastic, but the cocktail it produces is more focused on the flavors of the rum . I didn’t like this version as much as the white rum version, but I certainly wouldn’t refuse to drink it either. Finally, falernum. I used my homemade stuff, but you could easily use commercial offerings as well. The only caveat to keep in mind is that each Falernum will have a slightly different flavor profile so you may need to tweak the ratio a bit to get it to your liking. Sweet, sour, spice, water and alcohol. Those are the five, seemingly simple, components of every good punch. But, I’ll ask you this. Have you ever tried to come up with your own punch? Was it good? What about great? I’m willing to bet, coming from past experience, that it wasn’t amazing. If you’re lucky it was really good, but more than likely it was somewhere in the range of pretty okay to just good. The good (and bad) news is that we no longer live in a time when the quality of the punch can make or break you. In times past, a punch was your way of showing not only your culinary skills but your social status as well. You see, in past centuries the ingredients that go into punch (fresh juice, spices, spirits, etc) were expensive and, in some cases, very hard to come by. So, when you threw a big party you pulled out all the stops and got the best you could. You mixed it all up and served it out of your very best punch bowl. While the times of showing your status with punch may be gone, the times of enjoying a really good punch certainly are not. That brings us back to my original problem, where do you find the guidance to make some really epic punch? A great place to start is the recipes of times past. Or, even better, start in the pages of Dan Searing’s The Punch Bowl. 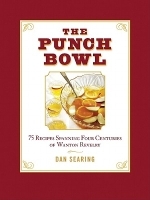 In this book Dan starts things off with a history of punch and the punch bowl, amazing pictures of which are sprinkled throughout the book. After the history section he gives a great intro on punch making pointing out some of the key lessons that apply as much to punch as to good cocktails. My favorites that he calls out are the use of good spirits and a great conversion chart for old recipes. Dan points out a key factor when choosing spirits for punch, go with good stuff, but don’t go crazy. For example, a top dollar cognac is going to be wasted on a punch. Instead opt for a high quality, but far less expensive, brandy. Following that, I love the chart for converting old measures to something more familiar. I mean, really, do you know what the hell a gill is? How about a puncheon? Yeah, me neither. Prep aside, Dan gets to the meat of this topic, the recipes. He includes 75 recipes spanning all categories and base spirits. Included are classics such as Rum Punch, Tiki staples like the Scorpion Bowl and modern creations from top notch bartenders. Each recipe states where it originated (and the its circa date), a brief description, how many servings (4-6 oz punch cups) it will produce and, most importantly, concise measures and directions. The finish and production quality of this book that really bear mentioning. The book is hardbound, with heavy, glossy pages. The pictures are bright and vivid and the punch bowls alone are enough to keep you turning the pages. I think this would make a great host(ess) gift. This book arrived just at the right time. I had a burning need to make some drinks for a party I was throwing and punch fit the bill perfectly. I leafed through the pages and found a quick punch that sounded super tasty. The resulting libation was easy to mix up, balanced and fruity and packed enough punch (pun intended) to keep the party going strong. and stir well. Slowly add the gin, and stir well. 2) Transfer the bowl to the refrigerator, and chill for 2 hours. 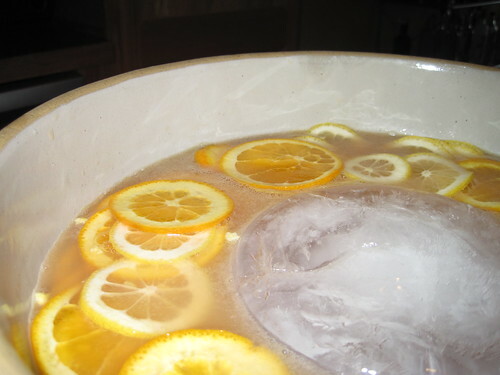 the punch with the fruit slices. I learned a few things from this punch experience. First, punch is freaking delicious. Second, I need a legit punch bowl. My ceramic bowl and old fashioned glasses worked, but it didn’t properly show my social status. ;) Third, make more punch than you think you’ll need. Trust me on this one. I was sent a couple JetBags a few weeks back for review and was excited but skeptical. The idea behind the bags is that they have absorbent material inside which will soak up the entire contents of a 750ml bottle of liquid should the need arise. Simply place your bottle in the bag, seal it up and you’re set. Seemed too good to be true. Not being one to take claims at face value I decided to put the JetBag to the test. I filled an empty Maker’s 46 bottle with black water (sure as hell not going to waste good booze!) and put it in the bag. After a few blows from a hammer the bottle burst and, to my happy surprise, the JetBag absorbed all the liquid. I had even put a couple holes in the bag hitting it with the hammer and nothing came out! Check out the video and see for yourself. So, the long and short is, I’m skeptical no longer. The bag held up great, the zipper is strong and the material of the bag is robust. If you had a leaky cork you’d have no problem whatsoever and should your bottle actually break the JetBag will contain it. I’ll definitely be buying a few of these to have on hand for traveling.